About Fall Colors – McLeese Landscapes, Inc.
One of the nicest things about living in northern climes is the ever changing seasons. For a few weeks, nature puts on one of its most spectacular displays as native trees and shrubs finish out the growing season in a brilliant display of fall colors. Jack Frost usually gets credit for the beautiful colors, but, in reality, fall color is controlled by both the plant’s genetic factors and the environment. 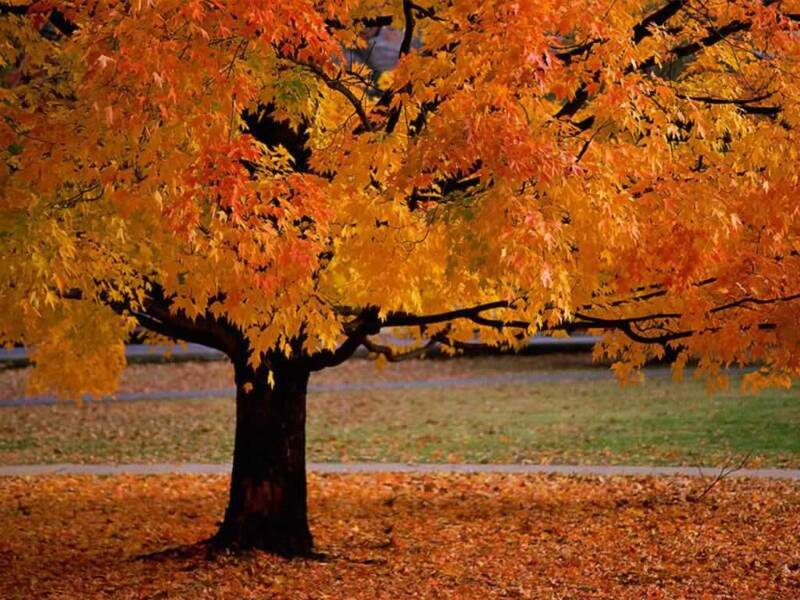 Carotene and xanthophyll are yellow pigments produced in foliage all year; along with chlorophyll, the green pigment. In autumn when short days and cool temperatures slow down the production of chlorophyll, the remaining chlorophyll breaks down and disappears. Then the yellow pigments that have been masked by chlorophyll show up. These pigments give the ginkgo its clear yellow color. Redbud, larch, hickory, birch and witch hazel turn hues of yellow and gold. Some plants produce anthocyanins (red and purple pigments) that may mask the yellow pigments. Some maples, dogwood, black tupelo, oaks and winged euonymous seem to be on fire with red and purple. Anthocyanin production increases with increased sugars in the leaves. A fall season with sunny days and cool nights increases sugar content of the leaves and intensifies fall reds. This also explains the two-tone effect on green ash which exhibits yellow on leaves inside the tree and purple on the outside leaves where they are exposed to sunlight. It also explains the amelanchier which may be red on top branches and yellow on bottom branches. The tans and browns of oaks are caused by tannins which accumulate as the chlorophyll disappears. Fall color starts in September with poison ivy and sumac and ends in November with the larches and weeping willows. Frost and freezing temperatures will stop the coloration process and blacken the leaves.